If there's one thing you should know about poisonous snakes, it's the fact that they are rather hard to kill. Just because you've cut off a snake's head doesn't necessarily mean you are safe around it. Even when a snake's head has been separated from its main body, it is still capable of responding to stimuli for as long as an hour. It can still lash out and bite. So don't even think of poking your fingers at a severed snake's head. 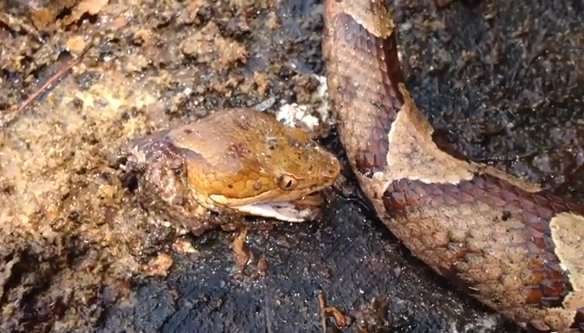 YouTube user Sam Billiter came across a copperhead once and cut off its head. Much to his surprise, the body just kept on wiggling. When the wiggling tail touched the severed head, the head suddenly snapped open its jaws and clamped down its poisonous fangs upon its own body. As was mentioned earlier, the decapitated head is still capable of responding to stimuli. Billiter captured the incident on video and you can watch it below. A severed snake head is still more than capable to kill anybody. As you can see from the video below, the copperhead still has its jaws snapping even though the head has been totally separated from its body. This is because of the snake's bite reflex. Even though a snake is dead, the bite reflex can still be in there moments after it has died.